To make a reservation at Plas Trevor B&B phone or email us now. A beautifully decorated Bed and Breakfast in Bangor, North Wales. Located close to the University with just a short walk to the city centre, Plas Trevor is the perfect place to stay. This deluxe bed and breakfast accommodation is situated on a quiet street and benefits from large and secure off-street parking. Plas Trevor Bed and Breakfast is ideally located for city breaks in Bangor, as well as for visiting family at the university and exploring North Wales. With close links to the A55, this accommodation is just a short drive from Snowdonia National Park, Llandudno beach, Conwy Castle and many more great places. Built on the grounds of an old slate mine, this B&B is very private and guests can be assured of peace and privacy throughout their stay. The natural slate wall which surrounds the rear of the property is an asset to the grounds and its delights are to be found in the fossils. 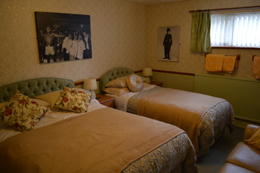 Plas Trevor has 6 guest rooms, all tastefully decorated and ensuite. All our beds are of the highest standard and no expense is spared on comfort. Tea and coffee facilities are also available in every room and complimentary shampoos are provided in guest’s bathrooms. For families two rooms can be connected to create a private family area. All visitors are welcome to use the Guest’s Lounge, where comfortable seating will help you relax and unwind; complimentary tea and coffee is also available in the lounge. The Guest Lounge also features a kitchenette, including a fridge, a microwave, glasses, plates and cutlery. In summer months the adjacent garden area can be used for BBQ’s while enjoying the clean Welsh air. A very large choice of breakfast options is available, catering for everybody’s dietary requirements. The choice of continental or full English breakfast is also available and the chef is known for her quality and hearty breakfasts. 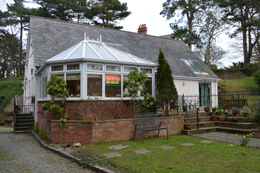 In this guest house, breakfast is served in the large, naturally lit conservatory, situated at the front of the house. Guests can eat, relax and read the morning newspapers before enjoying the rest of their day. 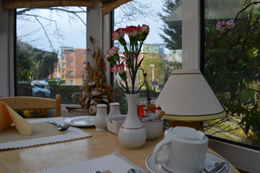 Plas Trevor is equipped for wheel chair access and is also happy to make any further adjustments to meet your needs, ensuring your stay is as relaxed and enjoyable as possible. Please email or call us for more information or to make a booking. Plas Trevor maintains copyright of this website and its content.